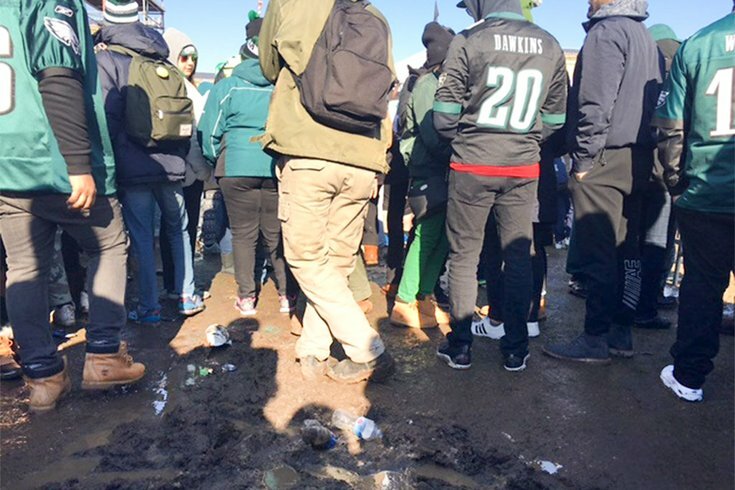 Eagles fans stand in the mud in front of the Art Museum on Thursday morning. Hundreds of thousands of Eagles fans crowded onto the grassy lawns lining the Benjamin Franklin Parkway for Thursday's jubilant parade and celebration. The lawns weren't in the finest shape before the parade, having endured a full season of Parkway events and nearly an inch of rain the previous day. But by the time the celebration concluded, the lawns were a soupy mess littered with heaps of trash. 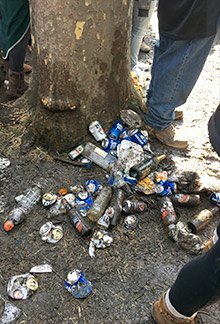 A pile of beer cans lie in the mud at Eakins Oval during the Eagles parade. Five days later, the Department of Parks and Recreation is still working to clean up the Parkway and estimate the damage. But the city doesn't anticipate the lawns being fully restored until May. "We typically seed and aerate the Parkway in the spring once the weather breaks and we will follow the same timeline this year," spokeswoman Jennifer Crandall said. "But you probably won't see any established turf until about May." The lawns were covered by an icy glaze when the earliest fans sauntered overnight Thursday onto Eakins Oval – the closest vantage point for the Eagles' victory speeches, delivered on the famous steps of the Philadelphia Museum of Art. But by mid-morning, the grassy areas had thawed into a muddy mess that only got worse as more and more fans jammed onto the parade grounds. "It was ice in the beginning and as the morning got warmer and people started walking through, it got muddier," Brian Burns, 56, of Bowie, Maryland, told PhillyVoice on the day of the parade. Burns, who arrived at Eakins Oval at 6 a.m., sat waiting for the Eagles parade in a folding chair. As the lawns filled up, Burns said some people ignored the muddy conditions as they searched for the best vantage points. Others turned around and headed elsewhere. But by the time the Eagles arrived – around 1 p.m. – the Parkway had filled with fans, providing Philadelphia with a jubilant celebration and one heckuva mess to clean up. PhillyVoice contributor Frank Burgos contributed to this report.